Whenever possible, we offer music students an opportunity to work directly with Symphony musicians in a collaborative workshop. These events are tailored to the needs of the students. This free, interactive, instrumental workshop is held annually at a school in Nova Scotia in memory of Redge Craig, a social worker and mentor to many people. The workshop’s goal is to connect the Symphony’s orchestra members with aspiring young musicians, particularly those who may not otherwise have the opportunity to learn from a professional mentor. 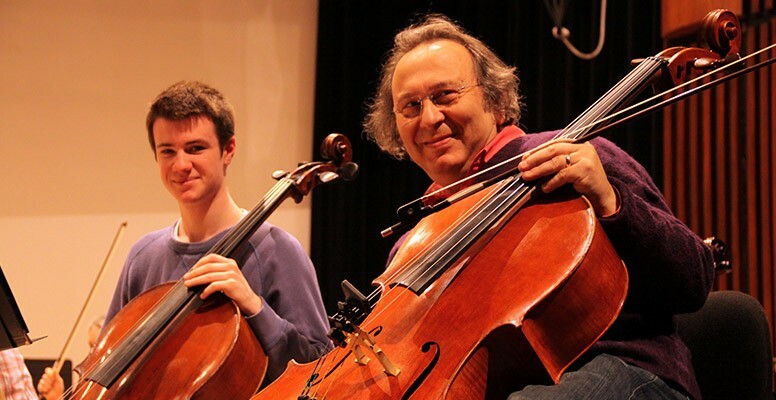 In May 2015, Norman Adams, a.k.a “The Man with the Cello” presented a workshop for students at Central Spryfield School. In January 2014, Symphony violist Kerry Kavalo presented to students at Oxford School in Halifax. In spring of 2013, hornist David Parker presented a workshop for students at Rockingstone Heights School in Spryfield. The 2012 workshop was provided by hornist Mary Lee and flutist Christine Feierabend for students of the Annapolis West High School Band program. In 2011, our workshop teamed up percussion students at Fairview Junior High in Halifax with percussionist D’Arcy Gray. Interested in applying for this workshop?